Opening weekend $16.021 million on 2511 screens. With each passing year, the odds that I’ll become a big-league baseball player continue to diminish. Of course, since the chances were virtually nil to begin with, so this fact doesn’t substantially affect my outlook on life. Still, at 35, it’s somewhat depressing to watch a ballgame and realize that if I played professionally I’d be regarded as one of the older players. At least The Rookie gave me some hope! 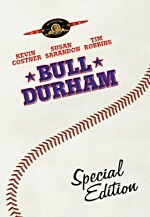 This film tells the real-life story of Jim Morris, a guy who made it to the bigs for the first time as a 35-year-old. The movie starts with his adolescence. As portrayed by Trevor Morgan, we see Jim’s obsession with baseball and also his strained relationship with his father (Brian Cox). His dad’s job in the Navy requires the family to move frequently, which makes it tough for Jim to establish roots. He maintains a deep love for baseball, even after the family lands in football-obsessed west Texas. The story jumps forward about three decades to find Jim (Dennis Quaid) still in the west Texas town of Big Lake, where he became a high school science teacher who also coaches their struggling baseball team. Married to high school counselor Lorri (Rachel Griffiths), time has not diminished the Texas consumption with football, so the baseball Owls get meager resources. They also stink, as they’ve won only a handful of games over the prior few years. As a teenager, a major league team drafted Jim, but various physical woes kept him from becoming a big leaguer. Those concerns also mean he shouldn’t throw very hard, but on a dare from one of his players, Jim lets one rip. It turns out he still has some serious heat; actually, his talent seems to have increased over the decades, as he appears to throw harder than he did as a kid. When it becomes obvious Jim still has a lot of fire in his arm, the team makes a bet with him: if they get to the district finals, he’ll go to a tryout for a major league team. This seems like a distant possibility, so Jim agrees. Of course, the Owls then tear off many wins in a row and indeed make it to the district finals. With this part of the deal achieved, Jim heads to a tryout for the Tampa Bay Devil Rays. He feels embarrassed amidst all the much younger players, but he gives it a shot nonetheless. His pitching speed impresses the scouts, and they call him back for another test. He passes that one as well, and he soon heads to a AA minor league affiliate of the Devil Rays. 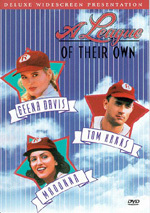 The rest of the movie follows Jim’s journey to the bigs. Despite his age, his talent as a reliever earmarks him for the majors. However, all’s not perfect in Jim’s world, as he actively debates the selfishness of his decision. The family encounters financial struggles and he badly misses his wife and kids. Should he continue to pursue his lifelong dream to pitch in the majors or should he return to be a responsible father? This being a Disney movie, don’t be surprised if Jim finds a way to do both. Don’t expect to find many other surprises as well. Although The Rookie displayed a few enjoyable moments, I thought it seemed surprisingly thin and ordinary much of the time. Much of the problem relates to the film’s bifurcated nature. Almost exactly half of the flick deals with Jim’s backstory and the rise of the Owls, while the second half depicts Jim’s attempts to play pro ball. Either subject could have filled a whole movie alone, which renders these two sections as less effective. Because we zip through the two stories, neither achieves the impact it should. The first half suffers the worst. It includes too many perfunctory aspects, as character introductions seem brief and lack any depth. Different participants fly by at too rapid a rate for us to really get to know them, and this renders potentially powerful moments as bland and without much strength. It didn’t help that the success of the Owls seemed so ridiculously inevitable. 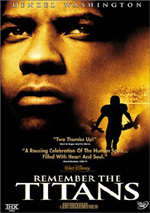 Even if you went into this flick with no foreknowledge of the story, it appeared obvious that they’d win a lot of games. The only questions revolved around how far they’d go, not whether they’d go somewhere. Of course, if you saw any of the promotional efforts behind The Rookie, the tale takes on even a greater sense of inevitability. Those elements clearly let us know that Jim will actively pursue a career in pro ball, so the segments with the Owls totally lack any suspense. Frankly, all those parts feel extraneous to me, and they pad the movie. It would have been more interesting if the story trimmed them down radically; we didn’t need such a huge amount of time devoted to an aspect of the tale that was so absurdly predictable. The half of the movie that follows Jim’s quest works better, but it also seems thin. He just rushes through the various divisions, and we get little of the impact this has on him other than to see his loneliness. Teammates receive very little screentime, and the whole thing feels very rushed and superficial. All at once, The Rookie includes too much story and too little. Since director John Lee Hancock packs in so many elements, he can’t explore any of them with any depth. This means that nothing gets much coverage, and Hancock also pours on the musical montages. I can’t recall the last time I saw a movie with so many of those! It feels like every few minutes we see some condensed material backed with a country tune. It gets old. Speaking of old, I don’t recall if they ever specify Jim’s age in the film, but I’d assumed that he was supposed to be in his mid-forties based on Quaid’s presence. I was surprised to learn that the real Jim was only 35 when he made his run for the majors. Assuming the filmmakers took no liberties to make Jim older in the flick, that means Quaid’s supposed to be 35 as well, and he just doesn’t look it. Quaid’s still very handsome, but he definitely can’t pass for 35 anymore. However, Quaid does provide a nice performance as Jim. He lets us see the character’s dilemma and his struggle while he makes him reasonably three-dimensional. Actually, all of the actors do pretty well in The Rookie, despite their abbreviated character arcs. I also must credit the filmmakers for their fairly strong commitment to the truth. From what I can tell, The Rookie takes only a modest number of liberties. It follows Jim’s baseball career pretty accurately, right down to the correct situation and batter for his first big league outing. Of course, a few small variations occur, but when I checked out Jim’s real story after I watched the flick, I felt surprised at how close the two came. At times, The Rookie works acceptably well. As someone the same age as Jim Morris who also grew up with a love for baseball, it’s almost impossibly for me not to be moved as he struggles to attain his dream. However, I thought that the film didn’t work as well as it should have. It packs too much extraneous material into its running time and lacks much depth. The Rookie provides a modestly entertaining program but not much more than that. 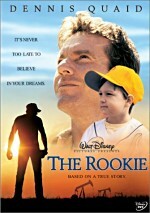 The Rookie appears in an aspect ratio of approximately 2.35:1 on this single-sided, dual-layered DVD; the image has been enhanced for 16X9 televisions. The movie looked solid as a whole, with only a few small concerns on display. Sharpness seemed good in general but could be a little erratic. At times, the picture came across as somewhat soft. This usually occurred during wider shots, but some close-ups also appeared oddly fuzzy. However, these instances happened fairly infrequently, as the movie usually seemed appropriately distinct and accurate. Jagged edges and moiré effects created no concerns, and I noticed no signs of edge enhancement. In regard to print flaws, I detected a few examples of specks and grit, but the image usually remained clean. As one might expect from this kind of sentimental drama, The Rookie featured warm and natural colors, and the DVD reproduced those well. The hues came across as vibrant and rich and never showed any signs of bleeding, noise or other concerns. Black levels also seemed deep and dense, while shadow detail was appropriately heavy but not overly thick. All in all, most of The Rookie looked quite good, but the minor flaws caused me to lower my grade to a “B+”. The Dolby Digital 5.1 soundtrack of The Rookie presented a clear piece that suffered simply from a lack of sonic ambition. This came as no surprise, for I didn’t expect a quiet drama like this to offer a whiz-bang mix. The soundfield maintained a fairly heavy bias toward the forward channels. Music showed nice stereo presence, while effects provided a reasonably natural and lively sense of atmosphere. Most of this stayed within the range of general ambience, but the track kicked to life modestly at times, such as during a thunderstorm sequence. The rears remained fairly passive most of the time; even shots at the ballparks continued to show a pretty consistent forward bias. Audio quality appeared positive. Speech seemed natural and warm, with no problems related to edginess or intelligibility. Carter Burwell’s score came across as lush and vibrant, and the music displayed good fidelity and range. Effects were accurate and distinct, and they managed some decent depth when appropriate. The pop of Jim’s fastballs as they hit the catcher’s mitt resounded nicely, and a few other segments also provided good bass response. Ultimately, the audio for The Rookie will win no awards, but it seemed generally satisfying. While not packed with features, The Rookie tosses in a decent roster of supplements. We start with an audio commentary from director John Lee Hancock and actor Dennis Quaid, both of whom were recorded together for this running, screen-specific track. Overall, I thought they provided a fairly good piece. On the negative side, too many of their remarks dealt with praise for various participants; much of the track simply told us how great everyone was. Otherwise, however, the pair offered a reasonable amount of decent information. Hancock dominated the commentary, especially during the early moments. It took Quaid a while to warm up, but he became substantially more active during the second half of the film. The pair gave us a fairly solid overview of the production as well as a few details about the facts behind the film. In the end, the commentary seemed moderately enjoyable, but it didn’t really stand out from the crowd. For a look at the reality behind the movie, check out The Inspirational Story. During the 20-minute and 34-second program, we find a few clips from the movie along with shots from Big Lake Texas and other locations as well as interviews. We hear from director Hancock, actors Quaid and Rachel Griffiths, screenwriter Mike Rich, producers Mark Ciardi, Gordon Gray and Mark Johnson, and real-life personalities Jim Morris, his mother Ollie Hale, Big Lake Wildcat editor David Werst, former Owl player Joe David Werst, pro baseball scout Doug Gassaway, Tampa Bay Devil Rays trainer Ron Porterfield, and sports agent Steve Canter. Although the program includes a little excess sentiment, overall it offers a concise little look at the Jim Morris story. Of course, the matters will largely seem familiar to anyone who already watched the movie, but it’s great to get a better view of the full facts behind the tale. “Story” places things in perspective and gives a refreshingly honest and accurate depiction of Morris’ tale. Most wonderfully, we get to watch videotape footage of Morris’ first big league confrontation, and this is intercut with commentary from Jim himself. “Story” offers a nice little synopsis that really seems more compelling and heart-warming than the film itself. In addition, The Rookie tosses in a collection of seven deleted scenes. This area starts with a 30-second introduction from director John Lee Hancock, and he also provides remarks prior to each segment. Including those statements, the deleted scenes area lasts 17 minutes and 14 seconds. The movie clips feature Dolby Surround 2.0 audio and non-anamorphic 2.35:1 picture that looks pretty rough at times; the image abounds with jagged edges. As for the scenes themselves, they mostly lack much spark. I thought one or two should have remained in the film, especially the one that showed a little more character depth for one of the Owls ballplayers. Nonetheless, the others seem pretty superfluous. Hancock’s introductions offer some information about the segments and also relate clearly why he dropped them from the film. Spring Training comes hosted by Mark Ellis, the baseball coordinator for The Rookie. After a quick introduction, we can launch into six different areas: “Pitching” (96 seconds), “Catching” (88 seconds), “Infielding” (81 seconds), “Outfielding” (92 seconds), “Hitting” (91 seconds), and a “Bonus Tip” (63 seconds). These offer brief bits of advice about each domain. This seems like an interesting addition, though the tips obviously remain pretty basic. When you start the DVD, you’ll find the usual complement of advertisements. Here we get a preview of The Santa Clause 2: The Mrs. Clause, Inspector Gadget 2, Monsters Inc., and Beauty and the Beast. From the main menu, you’ll discover a Sneak Peeks area that includes trailers for all of the above plus the upcoming DVD releases of Lilo and Stitch, Country Bears, and Beauty and the Beast: The Enchanted Christmas. A movie that tries too hard to be all things to all people, The Rookie falls short of its goals. The film has some effective moments, but the whole thing seems like a Reader’s Digest packaging that moves too quickly and superficially through its subjects. The DVD offers fairly good picture and sound along with a reasonably nice package of extras. Fans of the movie should feel generally pleased with this disc; it doesn’t excel in any way, but it maintains a decent standard. If you’re not already attached to the flick, though, you may want to consider a rental first. Note: this review covers the widescreen version of The Rookie, but a pan and scan edition also exists. Look carefully to make sure you get the right one. I’ve only seen the cover for the widescreen package, but it doesn’t mention anything on the front. Instead, there’s a small “widescreen” banner on the spine, and the specs on the back indicate that the movie’s 2.35:1. Why do they make it so hard to tell which version is which?